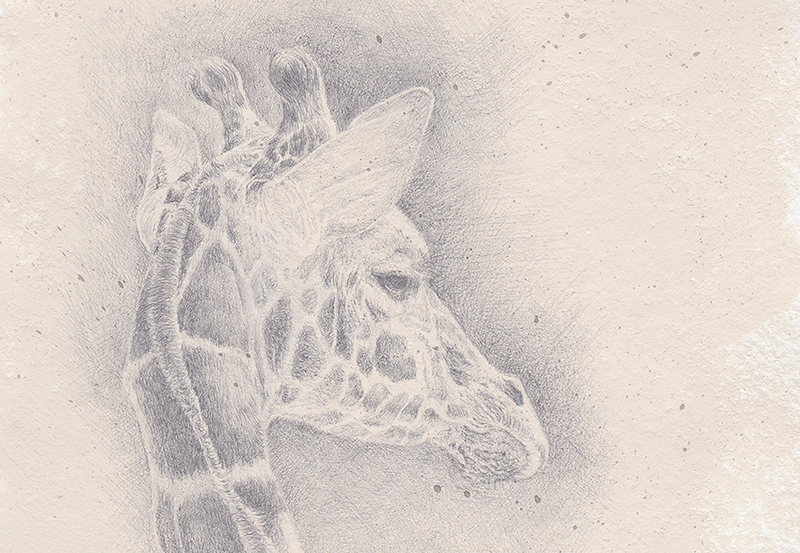 Study in Silver – Giraffe detail. Silverpoint is a medium that has long intrigued me. One of those ‘someday I will try that’ techniques. 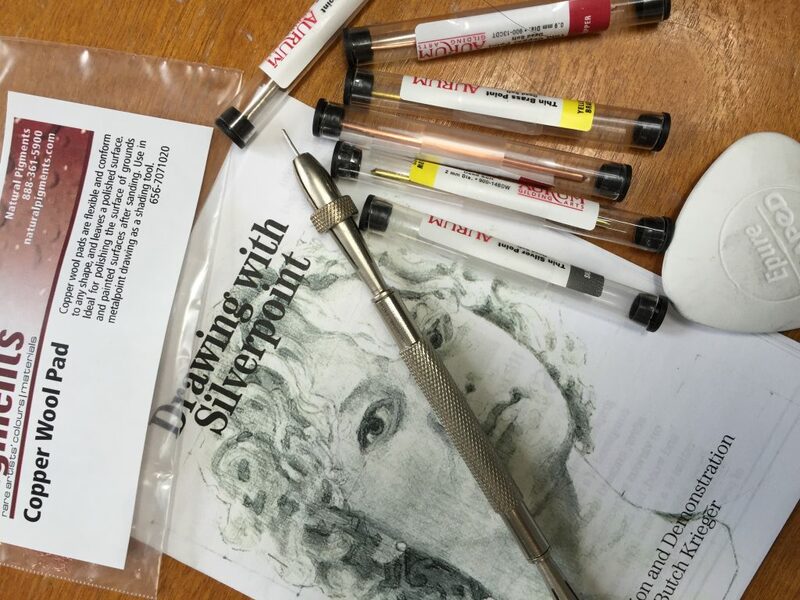 So in this time of exploring where I want to go with my art, I asked for a Silverpoint Kit from Natural Pigments for Christmas. So I plunged in! The first thing I required was a surface with a proper ground. In my holy grail search for a paper that has a surface that feels and paints like calfskin vellum (still have not found it!) I always look at papers when I am traveling. 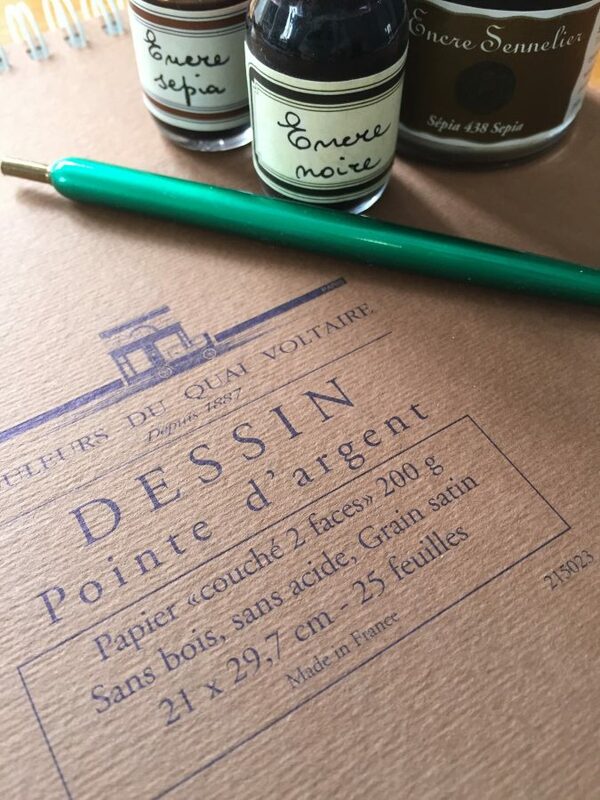 I found a pad of paper at Sennelier in Paris that had a wonderful slick feel to it and promptly added it to my shopping basket along with inks and dipping pens that I collect wherever I travel! The most important aspect beyond drawing (!) of silverpoint is a ground that will allow the metal particles to adhere to. Surfaces without some sort of ground will not take any marks from metal. The traditional historical grounds consisted of some sort of binder, i.e. rabbit skin glue, something with minute texture, i.e. ground up bones, marble dust, etc. and sometimes a white pigment, i.e. chalks, lead, and more recently titanium white powdered pigment. 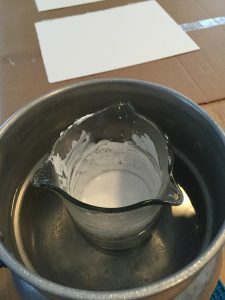 Once you have the dry ingredients, liquid needs to be added to get the mixture to a consistency that can be applied to a surface. Natural Pigments silverpoint ground in double boiler keeping warm for application on papers. I am just starting a drawing of an elephant on a paper prepared with the Natural Pigments ground; here is their description of this ground. 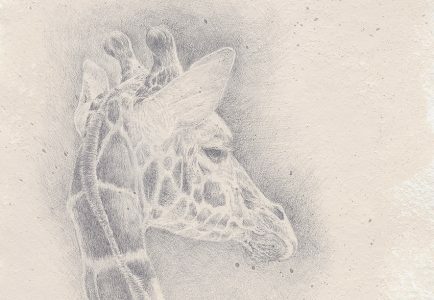 Another ground that takes silverpoint/metalpoint is casein, a milk-based opaque water medium. I have been painting with casein for a while now so it was easy to experiment with. I actually tinted the white so that I had a bit of a middle ground to work some highlights into. I took a piece of watercolor and brushed tinted casein on. The casein was the consistency of half & half with the addition of water. Here is the result of that experiment. Here is the drawing I did on that paper. 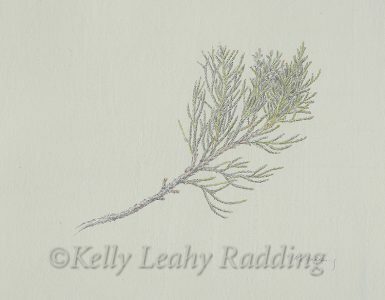 A study of a small red cedar with watercolor tints. I do like this one a lot. 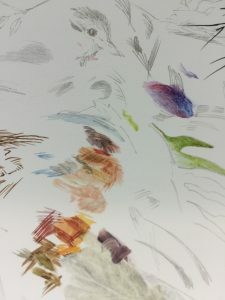 Then, continuing on, I decided that I wanted the ground to look almost like plaster, so that drawing and painting on the surface would almost be like working on a fresco. I took a watercolor test that I had abandoned on a piece of (expensive!) handmade Twinrocker paper that I had used as another experiment and abandoned. I used a palette knife to apply casein that was a little thicker than the previous experiment, and I randomly tinted and added color. I was able to cover up a tinted watercolor background that had a sepia ink drawing on it. A testimony to the opaque quality of casein! I have to say, I really enjoyed the feel of this piece, from the way the casein accepted the silverpoint to the way the watercolor felt as I applied it to the casein. Some cool things about this piece – There were some places where the palette knife didn’t quite cover the background so that the watercolor tint from the previous painting showed through a little. 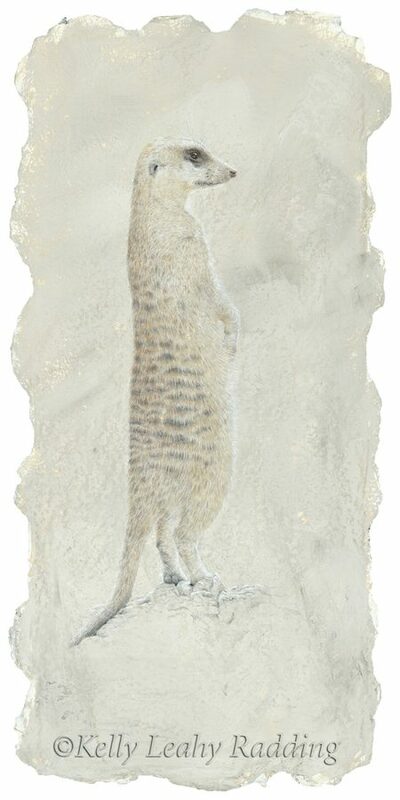 I also predominantly used Daniel Smith Primatek watercolors, another direction I am going in. Several of the Primatek colors actually have a shine, some more than others, from the actual mineral particles that the paint is made from. A match made in heaven – metals and minerals!! My journey continues, so stay tuned! This is wonderful! Your creativity and talent provide an endless world of fascination to those of us lucky enough to own some of your work, and will no doubt draw many others. Thank you so much for taking the time to share!! I love the way you describe your process as an exploration and a discovery! I’m really happy that you found the right materials and method for you! I also learned about silverpoint and metals and adhering your image to the ground. It was fascinating! Here is my 1st attempt at silverpoint. If viewing web site on a phone, click Read more to see full drawing.